With a Mainstage that generally runs for 10+ hours on Saturday and Sunday and is followed by late-night venue gigs as well as local-led offshoots that go until 4 AM, SappyFest is well-known for never letting up. Like most festivals, this can also mean catching an equal number of fantastic acts at 2 p.m. or 11 p.m. on the MainStage. 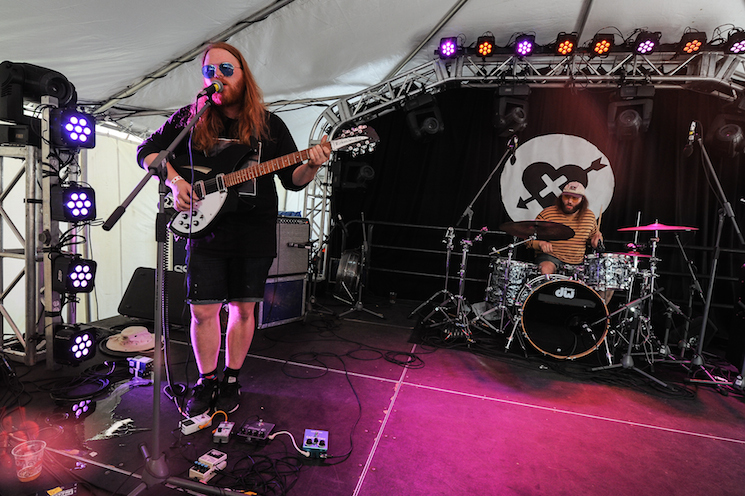 Reminiscent of a similarly wild early-afternoon set from fellow Halifax-based noisy pysch-pop garage rockers Cousins in 2012, Walrus was well placed between Human Music and Solids. Starting off with a rumble, the workhorses in colour-tinged sunglasses plowed through new and only slightly-less new tunes with quick transitions that only stopped occasionally for brief tuning. Dealing out a small handful of remaining t-shirts from their last run to fans who promised to buy the next ones, Walrus was left with a crowd cheering for one more song who will certainly be the first in line for whatever they produce next.